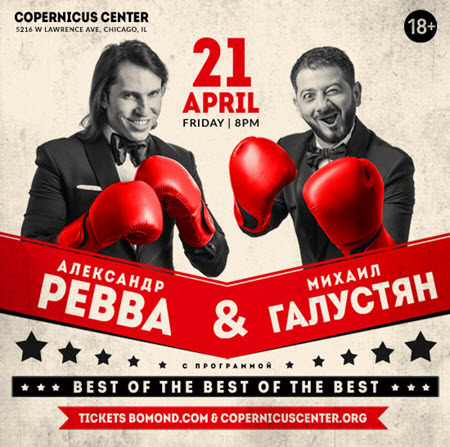 Bugz Entertainment presents Revva & Galustyan “Best of the Best of the Best.” This Russian Comedy team is in Chicago for only ONE show. Don’t miss the hysterical entertainment and laughter Revva Alexander and Mikhail Galustjan will bring..
Aleksandr Revva (Russian: Александр Владимирович Ревва; born 10 September 1974) is a Russian stand-up comedian, TV host and voice actor. A former KVN player, in 2006 Revva became a “resident” of the Russian Comedy Club show on TNT. As of 2009 hosts a TV show on NTV. Stage name: Arthur Pirozhkov, Alex Nowacki, Grandma Batman, Don Digidon. Aleksandr Revva was born in Donetsk, Soviet Union. According to his own statement, announced in the program “Пока все дома” (While all in the houses), surname Revva artificial. His ancestors, who lived in Estonia and had name Erwa immigrated to Ukraine, where he changed his name to Revva. He graduated from the College of Industrial Automation, then the Faculty of Management of the Donetsk State University of Management. He worked as an electrical mechanic at the mine. Since 1995, member of the team of KVN “Don State Agrarian University” from Donetsk, since 2000, member of the team of KVN “Burnt by the Sun”. As a KVN player, Revva performed alongside his teammate Mikhail Galustyan. From 2006 to 2013 he was president of the Moscow «Comedy Club». in 2015 he returned to the television show. In «Comedy Club» acts with Timur Batrutdinov, Garik Martirosyan, Andrei Rozhkov and Garik Kharlamov and a single thumbnail. Mikhail Galustyan (Russian: Михаи́л Серге́евич Галустя́н, born 25 October 1979) is a Russian-Armenian showman, comedian, screenwriter, and producer. Mikhail Galustyan was also a former participant in KVN and a show called Comedy Club (Russia). Awards Champion League KVN 2003, Winner of the Summer Cup of KVN 2004, 2005, 2009. Mikhail Galustyan was born on October 25, 1979, in the resort town of Sochi in southern Russia. Galusyan’s ethnology roots back to the city of Trabzon in modern Turkey, which used to be populated by a large Armenian community. His paternal grandfather, along with his 12 siblings escaped the Armenian Genocide during the early years of the 20th century and reached Sochi, what was a Black sea coastal town in the Russian Empire. Galustyan’s mother originates from Abkhazia. Being ethnically Armenian, Galustyan is of Hemshin origin, a branch of the Armenian genealogy originating from a diverse group of Armenians who in the past or present have been affiliated with the Hemşin district in the province of Rize, Turkey. When Galustyan was in kindergarten he participated in activities such as singing, dancing, and reciting poems. During his early life, Galustyan attended Sochi school, where he practiced the piano and began to hone his skills in a music class. He was also engaged in the puppet theater in the judo section at the Palace of Pioneers. After the fifth grade, Galustyan transferred schools at his parents’ instigation. At his new school he performed in a play on the stage. Galustyan’s role in the play was Winnie-the-Pooh. By the time Galustyan was in the 10th grade, he had joined his school’s KVN. Eventually, Galustyan became the captain of the school’s KVN team. His team went on to defeat all their opponent schools during the regionals and won in СГУТиКД (Sochi State University of Tourism and Resort Business). In 1996, Galustyan graduated from school and went into medical school, where he had studied to be an “assistant-obstetrician”. After graduating from college, Galustyan entered the Sochi State University of Tourism and Resort Business with a focus in Social Pedagogy. In 1998, Galustyan joined his university’s “Start” KVN team and took part in the Voronezh League, in which he helped the team reach the finals. After the performances in Voronezh, the team received an invitation to the Highest League for KVN in Moscow from A. V. Maslyakov. Galustyan was eventually expelled from the institute for serious lapse in attendance as his group was on tour and were performing up to three shows per day. In 2002, Galustyan became the leader of the team, “Baked by the sun”. In 2003, the team won that season’s championship. During this time, Galustyan also met his future wife, Victoria. And in 2004, “Burnt by the sun” won the KVN Summer cup and repeated this success in both 2005 and 2009. Galustyan has participated in the sketch comedy show Nasha Russia (channel TNT) since 2006. 5 seasons have been released. Galustyan starred in a series of advertisements for “Orion Choco pie”. Galustyan starred in a series of advertisements for Baskin Robbinsice cream. Galustyan is one of the Judges in the reality competition TV program Humor the comedian. (Рассмеши комика) on TV channel “Inter” (Ukraine). In 2011, Mikhail became a student of the Kutafin Moscow State Law University.